We’ll help you successfully finance your laundry business. Whether you’re an expert in the laundry business or starting fresh, rest assured that we make the financial process simple and painless. It’s easy, we provide you with two financing options based on your needs; Eastern Funding, or Huebsch financial. After choosing the best option for you, we start the pre-approval process. If you choose Eastern funding, you win. Or, if you choose Huebsch Financial, you win. It’s really that simple. 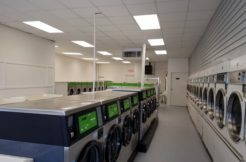 All of our comprehensive plans are tailored to your specific laundromat needs. Backed by the global leader in commercial laundry, Alliance Laundry Systems, Huebsch® has the experience, knowledge and resources to offer unmatched finance solutions designed specifically for the laundry industry. Whether you’re a seasoned investor or new store owner, purchasing new equipment or refinancing, Huebsch Financial understands your business and cares about your goals. Our team of laundry experts can develop a comprehensive plan tailored to your specific needs. Eastern Funding, LLC. offers commercial financing solutions that are laundry industry specific. Their experience with the laundry industry makes the finance process smooth and easy from conception to completion. Eastern Funding, LLC. will meet your individual needs of both finance terms and desired amount for project completion in a timely manner.